Does sugammadex mean the end of suxamethonium for rapid sequence induction? Suxamethonium (succinylcholine) is a depolarising muscle relaxant and often the first choice for muscle paralysis when a rapid sequence induction (RSI)1 is needed. In addition to working quickly suxamethonium has a very rapid offset. For both anaesthetist and patient these are very desirable characteristics, although they come at a price. The price is suxamethonium's long list of side effects, ranging from minor to life threatening.2 Were it not for it's life-saving fast-kinetics, suxamethonium's use in modern anaesthesia would no longer be justifiable. This article is part two in a three part series beginning with 'If sugammadex is the answer, what is the question?'. When rocuronium was first introduced in the 1990s it was met with excitement.3 Rocuronium's claim to fame was a very fast onset of action. Because it was less potent than other non-depolarising muscle relaxants of its generation (atracurium & vecuronium) a larger dose was required to achieve the same level of muscle paralysis. This dose created a large concentration gradient between plasma and the neuromuscular junction resulting in a faster onset of action. By giving a very large dose of rocuronium the anaesthetist could produce acceptable intubating conditions within 60 seconds, creation the first reliable modified rapid sequence induction. Unfortunately the result of using such a large dose of rocuronium is a prolonged blockade. Even at lower doses (0.6 mg/kg 2x ED95) rocuronium produces a block that lasts at least five times longer than suxamethonium. At the 1.2 mg/kg (4x ED95) modified-RSI-dose of rocuronium the block duration stretches out even longer, reaching the duration of pancuronium. In the event of being unable to intubate, or worse unable to ventilate, prolonged blockade is disastrous. At this point rocuronium only provided half a solution for the replacement of suxamethonium. Sugammadex is a modified Ɣ-cyclodextrin and the first 'selective relaxant binding agent' (SRBA). Sugammadex has a high binding affinity for the aminosteroid rocuronium, reversing its neuromuscular blockade almost instantly. By using a large modified-RSI dose of Rocuronium (1.2 mg/kg) and then a deep-paralysis-reversal dose of sugammadex (16 mg/kg ~$1,200), reversal of muscle relaxation has been demonstrated to be faster even than the offset of suxamethonium. But does this really mean the end of sux? Sugammadex reignited the anaesthesia community's interest in replacing suxamethonium. For the first time we could not only use rocuronium for a modified rapid sequence induction, but then use sugammadex to reverse the paralysis even faster than suxamethonium could itself wear-off. Several studies showed that sugammadex 16 mg/kg could reverse even deep rocuronium relaxation.4 Sørensen also showed no difference in the quality of laryngoscopy views, although the study was not powered to detect such a difference. Sørensen et al. simulated rapid sequence inductions, showing rocuronium-sugammadex yielded a median time from intubation to spontaneous ventilation of 216 s compared with 406 s for suxamethonium alone.5 Sugammadex is an ideal drug to reverse even large doses of rocuronium in a 'Cannot Intubate Cannot Ventilate' (CICV) scenario. This seems to make rocuronium-sugammadex a natural successor to suxamethonium. However in our rush to replace suxamethonium we are neglecting the goal of the rapid sequence induction. 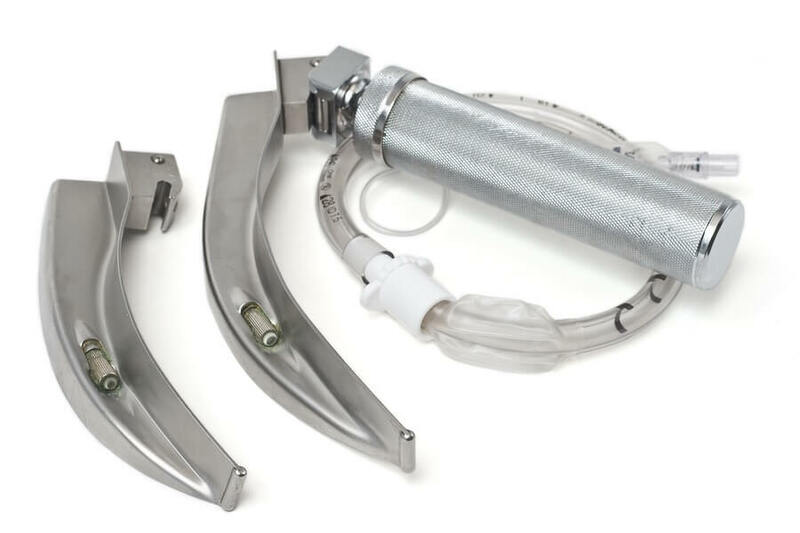 Just as it says on the tin, the aim of the rapid sequence induction is to rapidly induce anaesthesia allowing fast intubation and airway protection. Rapid offset, while desirable is not the primary goal. Suxamethonium has a warm place in many anaesthetist's heart because it quickly produces excellent intubating conditions. Fast onset and excellent conditions lead to quickly protecting the airway from blood or gastric contents. Rocuronium reliably produces acceptable intubating conditions within 60 seconds6 - but likely only excellent conditions at a higher dose (1-1.2 mg/kg). Most of the time the difference will not matter. But 'most of the time' is not an acceptable foundation for an anaesthetic technique. "There was a statistically significant RR favouring succinylcholine when comparing the primary outcome of excellent intubating con- ditions with a RR of 0.86, (95% CI 0.80 to 0.92). The number needed to harm (NNH) for this outcome was 8." Perry JJ, et al. Perry and team's Cochrane meta-analysis of 37 studies comparing suxamethonium to rocuronium included data from 1,300 patients.7 Sub-group analysis showed significantly better intubating conditions at 60 seconds for suxamethonium compared with rocuronium doses of 0.6-0.7 mg/kg. The authors showed no significant differences at higher rocuronium doses but due to the small number of studies could not make a recommendation. "...did not find conclusive evidence that increasing doses of rocuronium led to better intubating conditions. Succinylcholine created significantly more excellent intubation conditions than rocuronium at doses of 0.6-0.7 mg/kg . There was no statistical difference for the 0.9-1.0 mg/kg or 1.2 mg/kg groups. It is difficult to draw conclusions regarding the higher doses of rocuronium as there are relatively few studies which have examined the higher dose (1.2mg/kg) of rocuronium (n = 86)." And here lies the problem. The purpose of rapid sequence induction is rapid intubation. If rocuronium cannot be shown to provide as good intubating conditions as suxamethonium even at a higher dose, then rocuronium should not universally replace suxamethonium. In that context it is ironic that the arrival of a drug suitable for reversing rocuronium when intubation fails is driving this debate. Reversal of deep rocuronium paralysis in a 70kg patient requires 1.1 grams of sugammadex. In a 100kg patient we need 1.6 g; that's eight ampoules of sugammadex! Ignoring the cost (upwards of $1,600) drawing up eight ampoules of anything takes time. We need immediate access to eight ampoules (is it in your anaesthetic trolley, difficult airway cart or locked in a drug cupboard?) and someone to draw-up and administer that drug. In a critical airway situation none of that happens quickly. Sørensen's study started the clock at intubation then immediately gave sugammadex. In a true CICV crisis the critical factor will be time to decision to reverse. When we use suxamethonium the clock starts at the end of the syringe. When we use sugammadex the clock cannot start until we decide, prepare and give our wonder drug. Sugammadex's 200 second lead will be quickly eaten up and exceeded in a true airway crisis. It is the rare anaesthetist or anesthesiologist who can make the decision to bail out of a failing intubation in the first 2 minutes. The psychological pressure of an emergency induction makes our fixation on intubation more likely rather than less. Suxamethonium reversal is (generally) automatic. Rocuronium reversal requires a decision by the anaesthetist at a time when decisions are often not well made. Relaxant reversal is no panacea in an airway crisis. 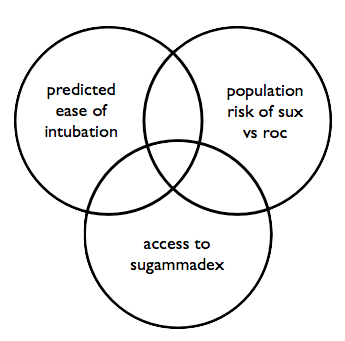 Kyle, Gaylard and Riley described a CICV scenario where reversal with sugammadex did not relieve the airway loss and a surgical airway was still required.8 The perception of sugammadex as an RSI safety net may encourage anaesthetists to make decisions that they normally would not. Ease of intubation for this patient. Will compromised intubating conditions with rocuronium matter? How critical is it to protect the airway quickly for this patient? Accessibility of sugammadex. Is it in the room? Is there enough for this patient? Is there someone other than my anaesthesia assistant and I who can quickly prepare and administer it? Risk of suxamethonium versus rocuronium for your population. Is the risk of anaphylaxis (or other serious side effects) for suxamethonium significantly greater than for rocuronium for this population (e.g. in the US) or not (e.g. in Europe and likely Australia). Your decision to use rocuronium-sugammadex must be contextualised: to your resources, your population, your patient and your patient's needs. Over simplified black-and-white rules have very little place in anaesthesia. Sugammadex is a unique drug with an amazing ability to reverse rocuronium paralysis. It extends the situations where rocuronium is a good relaxant choice, particularly for modified rapid sequence inductions. While sugammadex increases the safety of rocuronium use for rapid sequence induction, the evidence does not yet support a wholesale shift from sux to roc-sugammadex. It is important for us not to loose sight of the purpose of the RSI: rapid intubation and airway protection. The drug that best facilitates this in each individual patient is the drug to use. Suxamethonium still has much to offer our patients. Sugammadex has been shown to quickly, effectively and consistently reverse even deep rocuronium relaxation. In the RSI situation rocuronium reversal is faster than even the offset of suxamethonium. There are only a small number of studies investigating sugammadex use in the RSI. Most studies use simulated RSI. The practical use of sugammadex for reversal of Roc-RSI is questionable outside the controlled environment of an RSI simulation. Roc-sugammadex offers an alternative to suxamethonium in specific situations where it is contraindicated, but the weight of evidence does not currently support total replacement of suxamethonium. Finally, in part three next week I will explore the evidence for and against using sugammadex to manage rocuronium anaphylaxis. Daniel Jolley is an anesthesiologist, founder and CEO of metajournal, providing personlized medical research recommendations to fellow doctors. Read more from Daniel or follow on twitter.